While reading the The Hunt of Her Life, you will travel with Samantha and the author along a trail filled with surprising twists, sudden turns, mystery and even what some call a miracle. And when the journey is finished, you may never look at people and their pets, motherhood - and perhaps even God - in the same way. The vibrant color photos are carefully positioned throughout this professionally designed book so you can see lifelike print images of Samantha and other dogs as you are reading about them, making you feel like your are right there with them! A thoughtful story for pet enthusiasts: Those who love pets will appreciate the deep bond shared between this unwanted rescue dog and the book's author. Their unique closeness helps Samantha to twice defy certain death. A warm story for mothers: Moms will be touched by the relationship that the author has with his own mother. Their connection helps him to overcome many frustrations and deal with overwhelming odds in his suspenseful nationwide "hunt" to try to locate the unknown birthplace and family roots of his unregistered rescue dog after she eventually succumbs to illness. A riveting story for those who enjoy suspense: Readers who like suspense will be intrigued and fascinated by the crafty investigative journalism techniques the author uses to try to uncover his dog's family tree. A spiritual story for everyone: Everyone will be in awe as they come to realize that God all along has been providing a guiding hand in Samantha's journey through life and astonished when they ultimately learn about the mystical gift at the end of this rescue dog's trail. Joseph A. Reppucci of Lexington, Massachusetts, worked 35 years as a reporter and editor on major daily newspapers in the Greater Boston area and is retired from The Patriot Ledger of Quincy, a GateHouse Media newspaper. He also worked at The Telegram & Gazette of Worcester, The Sun of Lowell and The Evening News of Salem. Mr. Reppucci writes an online column about dogs, The Ruff Report, which appears on hundreds of newspaper websites. The column focuses on animal abuse and rescue as well as other pet topics such as adoption, behavior, health, medicine and safety. He is a graduate of Lexington High School and of Suffolk University in Boston, where he was the editor in chief of The Suffolk Journal, a student newspaper that won acclaim for its quality from the Columbia University Graduate School of Journalism. Friend him on Facebook/joseph.reppucci. 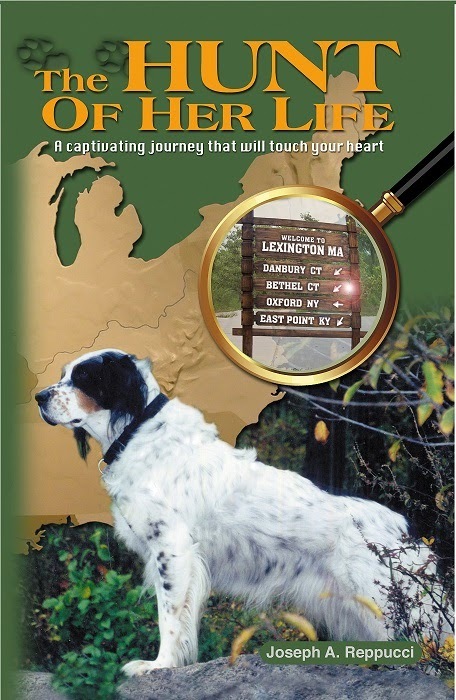 A wonderful journey made all the more remarkable by the determination of the author to honor his beloved English Setter and her bloodline. Twist after twist, turn after turn, you're never let down as The Hunt of Her Life proceeds toward its uplifting conclusion. Vivid photos complement the intelligent narrative. Don't forget the tissues, but don't worry - there's plenty to smile about, too." "You will enjoy this book! It's a love story that can be appreciated even by non-dog people, even crazy cat ladies like me." The Hunt of Her Life Sequel is the continuation of the mystical story of rescue dog Samantha's life. This pretty tricolor bird dog's gripping tale appeared to have ended at the conclusion of The Hunt of Her Life. She had gone over to the other side of The Rainbow Bridge, and the overwhelming task of extending her nearly extinct bloodline to a new generation had been successful with the birth of her grandnephew, Sampson. But surprisingly, the birth of Sampson would not be the end of the story of Samantha's captivating journey through life. His entry into the world would turn out to be the unexpected continuation of her narrative. This nicely designed deluxe full-color book, a memoir by longtime newspaper journalist Joseph A. Reppucci, contains more than 50 beautiful photos of dogs to help illustrate the continuation of Samantha's compelling and uplifting story. The vibrant color photos in the Sequel, just like in the original book, are carefully positioned so you can see images of the dogs as you are reading about them, making your feel like you are right there with them! So move forward on this heartwarming journey – now with Sampson – in The Hunt of Her Life Sequel. The Hunt of Her Life Book Series (Original and Sequel), deluxe full-color books, is available to customers in the United States by ordering direct via Paypal. It makes a truly unique gift for holidays, birthdays or any other special occasion for animal lovers of all ages. Prefer to get one or both on Amazon? The Hunt of Her Life Original and Sequel books are also available on Amazon! Get single copies of either book or get the set. FREE SHIPPING when you order both books! *PLEASE NOTE: The Hunt of Her Life (*e-Edition) is a condensed version of the Original print book. The e-Edition is formatted as a traditional black-and-white book without photos. The print edition is a beautifully designed deluxe full-color book that contains more than 60 vibrant color photos of dogs and has several additional chapters.